Magnet Commerce allows you to get important feedback from your customers by enabling product reviews and ratings on every product page of your Magnet Commerce store. You can also publish customer reviews/ratings on your store's pages, thus making them available for all your visitors to read. Figure: Enable the product review and rating functionality on all your store's product pages. Figure: Click on "Site Content > Reviews" in the Administration panel to view/edit/publish the product reviews/ratings available. In the "Reviews" page you will find a function for searching specific reviews as well as a full list of product reviews and ratings available for editing and publishing. Right below the search function, you will see a list of all reviews available (or, if a query has been performed, the specific reviews located by the search function). Figure: List of product reviews and ratings. Time: The time and date the review was submitted. Published: "True" if the review is published on your product page and "False" otherwise. Customer name: The name of the customer that provided the review. Product: The product that the review was written for. Ratings: The rating assigned to the product. This is a number in the scale of 1-5. Actions: Shows you "Publish/Hide/Edit": By clicking on "Publish" the current review will be published on your product page. Clicking "Hide" will unpublish the review from your store. Finally you can edit/save/publish/delete a review by clicking "Edit". Please read through the following section for more details.
! Each column on the Reviews List can be sorted in ascending or descending order, by clicking the title of the column. For example, to sort reviews in ascending order by Ratings simply click on "Ratings". To sort back in ascending order, click on "Ratings" again. This page contains information about the time and date the review was submitted, whether the review is published on your store, the customer and product name and the rating assigned to the product. The text of the review is also available for editing. Delete: Delete a review from your records. If the review is published it will automatically be removed from your store pages.
! When you choose to "Delete" a review, the review information will totally be deleted from the system so make sure you really want to do this. Save changes: Save any changes you have made in the review text.
! If the review is published the changes will also become available on your store pages. Save changes and publish: Save any changes you have made in the review text and publish the review/rating on the products online page. Use this if the review is currently hidden from your store pages. Figure: When enabling the product review and rating functionality, your store visitors will be able to submit ratings and/or reviews on all product pages. Rate this product: Store visitors can rate the product on the scale of 1-5.
Review: Store visitors can provide a review and click on the "Submit" button to submit their article.
! Visitors will have to login to your store before they can submit a review/rating of a product. Once the review is submitted, the visitor will be presented with a "thank you" note. Figure: The visitor will be presented with a "thank you" note for submitting a review. All store visitors can view the reviews and ratings written by other members. Figure: All store visitors can see reviews and ratings written by other members. Figure: In the product page, the average rating is shown next to the product name. Enable the product review and rating functionality on all your store's product pages, by ticking the "Enable Reviews/Rating" check box in the "Setup > General" page. 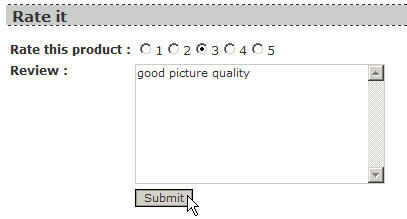 Click on "Site Content > Reviews" in the Administration panel to view/edit/publish the product reviews/ratings available. The "Reviews" page: a function is in place for searching specific reviews. A full list of product reviews and ratings is also available. In the "Reviews" page: click on "Publish" to publish a product review to your store, "Hide" to unpublish it and "Edit" to edit/save/publish/delete a review. On your storefront: When enabling the product review and rating functionality a section for submitting a rating and/or review will appear on all product pages. In addition, all store visitors can see reviews and ratings written by other store members.